Donate today to our annual food drive this holiday season! The Arts Coalition of the Alleghenies is excited to announce the return of our annual food drive this holiday season. This year, the Coalition is asking for single-serve food items that are peanut free. 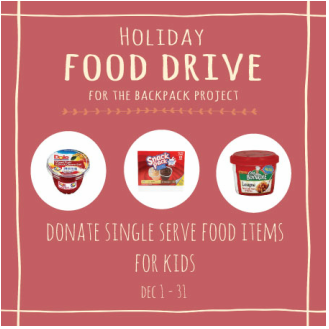 Donations will go to the Johnstown and Somerset Backpack Projects, organizations that provide backpacks full of ready-to-eat meals to over 300 children every weekend during the school year. The public can drop off their donations from now until the end of the year at participating Arts Coalition member locations. Please check their profiles for hours of operation.